Anchorage, Alaska turns the Last Frontier red, white and blue for the Fourth of July. The city starts our Independence Day celebrations early – and not just because Alaska loves a good party. The community of Eagle River gets a jump start on Independence Day celebrations on July 3. Sponsored by the Eagle River Lions Club, food, entertainment and games in Eagle River Lions Park make the most of 19 hours of daylight. The extra sun means plenty of fun before nightfall, and fireworks as the sun gently dips for a few hours. Anchorage’s Delaney Park Strip is host to the annual Anchorage July 4th Celebration; rise and shine and hit the pancake breakfast, at 8 a.m. Then head from pancakes to procession; the Anchorage 4th of July Parade begins at 11 a.m. with a festival following. The event is open from noon to 6 p.m. and includes music, games, vendors and food. The Harvard Club reads the Declaration of Independence at 1 p.m. Enjoy period costumes from the Revolution. If you’re hungry, grab a bite to eat before the annual fireworks show. Anchorage dining includes some of the freshest seafood in the world, which Alaska chefs offer up in a variety of mouth-watering creations in Anchorage restaurants. The annual Alaska Baseball League doubleheader between crosstown rivals the Anchorage Glacier Pilots and the Anchorage Bucs takes place at Mulcahy Stadium, with the games starting at 7 p.m. and 10 p.m. Fireworks put an exclamation point on the conclusion of the second game. The best spot to see the fireworks is right near the action. Grab a blanket or folding chair and stake out a place on Kosinski Fields next to Mulcahy Stadium. The fireworks typically start at the conclusion of a baseball doubleheader at Mulcahy Stadium. Plan for a start time for fireworks sometime after 11 p.m.
After a full day of activity and celebration, there&apos;s nothing quite like unwinding in a cozy room. Anchorage lodging choices provide the perfect combination of sophistication, comfort and amenities. 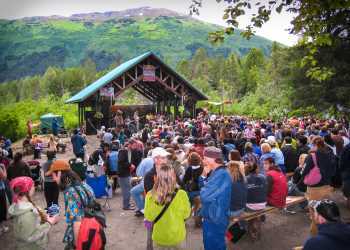 A mountain tradition two hours south of Anchorage, the party in Seward begins at 12:01 a.m. on July 4th with fireworks. The biggest bang comes later that morning with the town&apos;s famed race, Mount Marathon. The course is straightforward, but far from easy: start downtown, run to the top of the 3,022-foot mountain, then run back to the finish. It is rumored the race originated as a bet between locals that the mountain could not be tackled in less than an hour. Runners get schooled by steep slopes and gravity, inertia and loose shale, and get introduced to oxygen debt and lung capacity. The winners are usually locals who can practice on the mountain, or Alaska Olympians who can turn oxygen into speed.